As time goes by, we learn more and more about students’ interest in becoming pioneer superstars and entrepreneuring their dreams. Students from different departments and years have provided us with the insights that they want to be more involved in innovation creation on campus, meet more entrepreneurs, and gain the essential skills that will help in any business climate; whether that be a cutting-edge new disruptive startup, or adding further value to large and established corporation. Well, you spoke and we listened. As part of several initiatives to accommodate more students this year, we launched our Entrepreneurship Certificate program for Business students last semester. Commerce and Management students at the University of Toronto Mississauga now have the valuable opportunity of attending a variety of professional development events and earning points in the Professional Skills Development Program (PSDP). ICUBE has collaborated with the Department of Management and Innovation to offer entrepreneurship-focused events that also count for PSDP Points. 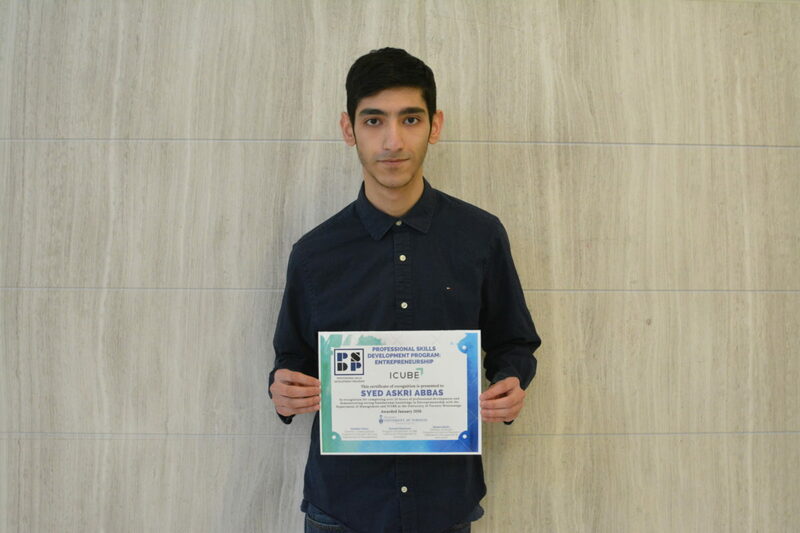 “During the past three months I have enjoyed taking part in ICUBE workshops, Fin-tech guest lectures, and the Pitch Competition. It gave me insight into how start-ups grow their business during their first year. It also let me see the great work ICUBE and the University of Toronto Mississauga does to support its startups. In addition to the workshops and events attended, I was also given the opportunity to volunteer with one of ICUBE’s startups. I volunteered with ‘CarbonQ’ as their market research intern. I was happy to see CarbonQ place third at the Pitch competition earlier this month”. If you want to learn more about getting involved with entrepreneurship, make sure you come out to our Women in Tech panel ( in partnership with Thomson Reuters), follow us at @ICUBEUTM or check out Innovation Association, a new student led club that provides more accessible information and resources to future entrepreneurs!